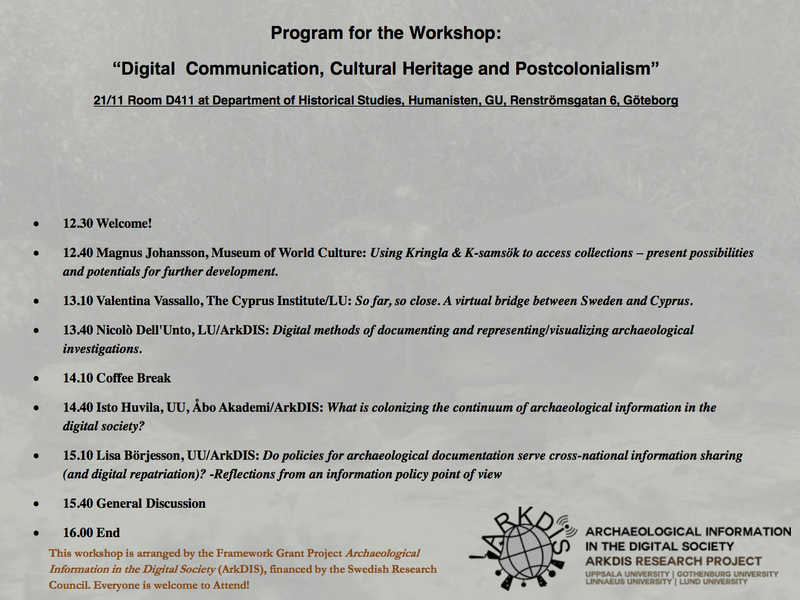 ARKDIS project organises a workshop "Digital Communication, Cultural Heritage and Postcolonialism" in Gothenburg on November 20-21, 2014 with an open session on November 21 at the Department of Historical Studies, University of Gothenburg. 12.40 Magnus Johansson, Museum of World Culture: Using Kringla & K-samsök to access collections – present possibilities and potentials for further development. 13.10 Valentina Vassallo, The Cyprus Institute/LU: So far, so close. A virtual bridge between Sweden and Cyprus. 13.40 Nicolò Dell'Unto, LU/ArkDIS: Digital methods of documenting and representing/visualizing archaeological investigations. 14.40 Isto Huvila, UU, Åbo Akademi/ArkDIS: What is colonizing the continuum of archaeological information in the digital society? Seminar presentation by Lisa Börjesson at Information Access Seminar, 107 South Hall, UC Berkeley School of Information Friday November 14 2014, 4-5 p.m.
work documentation, and on efficient dissemination and retrieval of that documentation. 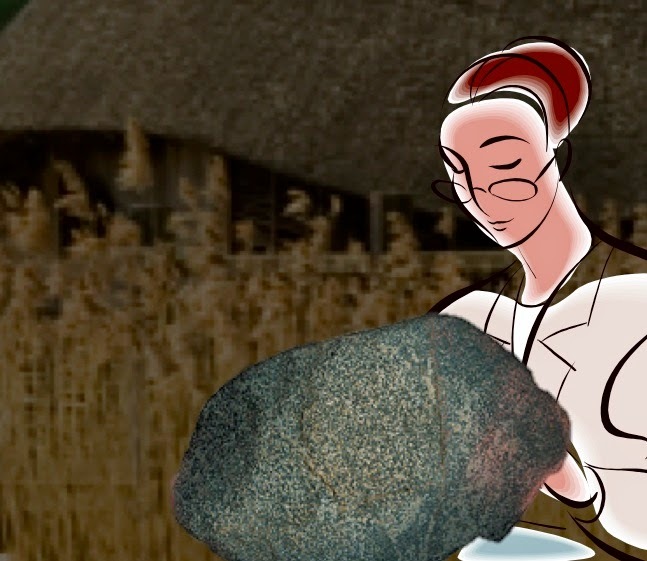 As most archaeological surveys and excavations are performed outside university research as contract archaeology, a majority of the documentation is produced and managed in professional settings. The genres of professional documentation, also known as ‘grey literature’, have an ambiguous status in archaeology. On the one hand they represent most of the archaeological undertakings; on the other hand they are accused of being inaccessible and of having low quality content. Academic archaeologists neglecting the grey literature are in turn blamed for being disrespectful of professional archaeologists’ work. The discussion of the ‘grey literature problem’ in archaeology is multifold, but often returns to a tension between academia and the professional sphere. In my dissertation research I argue the focus on the tension between academia and professional archaeology limits understandings and usages of professional archaeology documentation. I propose a perspective on professional archaeology documentation as shaped by a larger context, including policy, public administrative and market logics as well as those of academia and professional work. The seminar presentation will give a line of historical examples supporting the study of archaeology documentation as shaped by a larger context, explain my dissertation research design, and briefly touch upon findings this far. Isto is participating in the 2014 Association for Information Science and Technology (ASIS&T) Annual Meeting in Seattle, WA. He gave a talk on context making in archaeological work as a part of the SIG-USE (for a special interest group for information seeking and use) research symposium on Saturday.